A week ago, nearly-42-year-old Chris Horner stunned the cycling world by winning the Vuelta a España, the last of the season’s three-week-long grand tours. Unfortunately, the race was difficult to follow in the US, and his feat received limited coverage. The second of the tours, the Tour de France, has become a major sports story here. But good luck if you want to follow the Giro d’Italia or the Vuelta. Part of the problem is that television coverage in the US is restricted to NBC’s Universal Sports, which is not generally available. (I complained about this last month in the context of the track and field world championships.) Internet streaming is restricted as well, offered only to those with cable or satellite packages that include Universal. So forget watching it. The American veteran Christopher Horner won the Vuelta a España on Sunday at the age of 41, making him the oldest champion of one of cycling’s three-week grand tours. 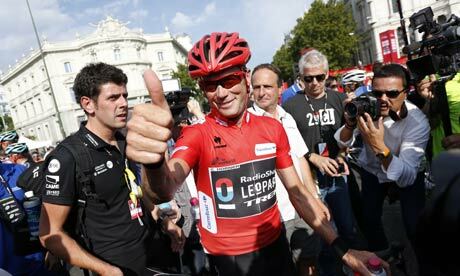 Horner completed the traditional arrival to the Spanish capital with his RadioShack-Leopard team-mates without mishap. Horner, who will turn 42 next month, beat his nearest challenger, Vincenzo Nibali, by finishing ahead of the Italian in each of the final three mountainous stages before Sunday’s 110km flat ride from Leganes to Madrid. Michael Matthews won the 21st and final stage in a sprint. The previous oldest winner for one of the three grand tours – the Vuelta, Tour de France and Giro d’Italia – was Fermin Lambot, who won the 1922 Tour at the age of 36. How Horner won is worth a few words. His challenger Vincenzo Nibali is one of the world’s best riders, in his prime at 28 years old. He has had great success in all three tours, with a win and a second place in the Vuelta (2009 and 2012), third, second, and first in the Giro (2009, 2019, 2012), and a third in the Tour (2011). On Thursday of week three, Nibali began the stage in first place overall, 28 seconds ahead of Horner and poised to win another grand tour. Thursday brought the first of three intense mountain stages, on each of which Horner finished ahead of Nibali. By the end of Thursday’s stage, Horner was just 3 seconds behind Nibali overall. A day later, he was 3 seconds ahead. And Saturday, in an astonishing performance, Horner finished second on the stage, 28 seconds ahead of Valverde in third and Nibali in fourth, thereby extending his overall lead to 37 seconds over Nibali and 1′ 36″ over Valverde. The final day in Madrid is left for the sprinters to fight for stage victory, with the overall leaders maintaining their positions. Hence, Horner had victory in hand. I would have loved to watch those mountain stages.